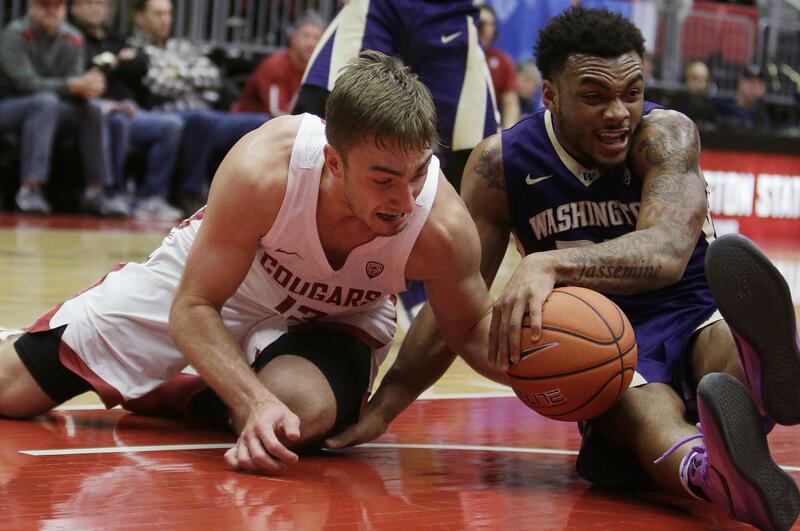 UPDATED: Sun., Jan. 7, 2018, 9 p.m.
PULLMAN – David Crisp scored in the lane with 1:46 remaining to give Washington the lead and send the Huskies over Washington State 70-65 on Saturday. Crisp gave the Huskies their first lead of the second half with a steal and a fast-break layup with 3:21 remaining. After Washington lost the lead again following buckets from Robert Franks and Jeff Pollard, Crisp gave the Huskies a 66-65 advantage with 1:46 remaining off another layup. WSU’s Milan Acquaah missed two free throws and the Cougars three shots after that. Jaylen Nowell finished with 15 points and nailed a jumper in the lane with 25 seconds remaining, extending the Huskies’ lead to three, which was followed by a Franks missed 3-pointer with 10 seconds left before Matisse Thybulle added two free throws for Washington. Franks finished with 22 points and 12 rebounds for the Cougars (8-7, 0-3). Viont’e Daniels had 13 points, going 3 of 6 from 3-point range. WSU’s Malachi Flynn, who came in averaging 15.6 points per game, scored only five, going 1 of 9 from the field, but had seven rebounds. Published: Jan. 7, 2018, 8:59 p.m. Updated: Jan. 7, 2018, 9 p.m.